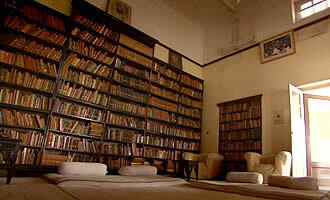 Anand Bhavan is the ancestral home of the Nehru family, in Allahabad. At midnight on August 14/15th, 1947, India and Pakistan became independent states. With Jawaharlal Nehru as prime minister of the new democracy in India, the Indian National Congress—the country's strongest advocate for self-rule—became the dominant political party. Pakistan's emergence as an independent nation realized the ambitions of the Muslim League led by Mohammad Ali Jinnah. Along with the pressure exerted by Mahatma Gandhi, Nehru and Jinnah, and public outrage at events like the Amritsar Massacre, independence for India and Pakistan came as the result of developments in the region during World War II. After Britain declared itself and India at war with Germany, without consulting Indian legislatures, the Indian National Congress leaders demanded independence in return for wartime cooperation. Britain, desperate for India's support, agreed to negotiate after the war, stipulating that no regions would be forced to join the independent state. In 1946, after negotiations between Britain, the Indian National Congress, and the Muslim League failed, a plan was adopted for partition of the subcontinent into the separate nations of India and Pakistan, which at the time also included what is now Bangladesh. Partition led to mass migrations of Muslims to Pakistan and Hindus and Sikhs to India, and violence in both countries that resulted in more than a half million deaths. For decades, territorial and religious disputes would characterize the relationship between the two countries. Indeed, in 2009, Indian and Pakistani troops still face each other across a ceasefire line in Kashmir, now divided between the two countries. 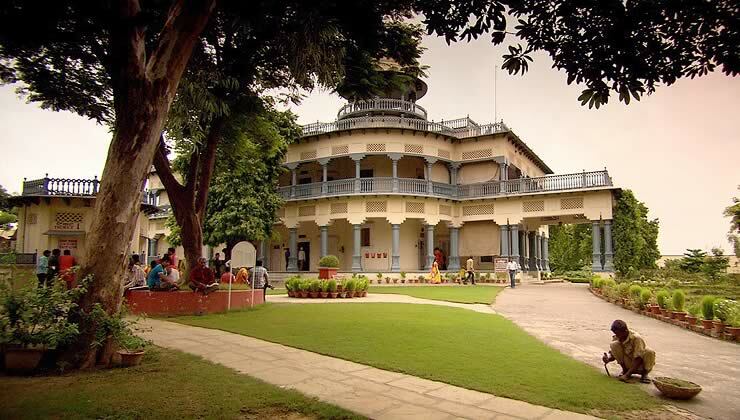 Anand Bhavan (House of Joy) in Allahabad, in the Indian state of Uttar Pradesh, was the ancestral home of India's first Prime Minister, Jawaharlal Nehru, and was the site of much political activity in the years leading up to India's independence. When Nehru was ten, his father, Motilal Nehru, a lawyer and leader of the Indian National Congress, acquired the lavish 42–room house. Nehru learned to swim in the house's indoor swimming pool and enjoyed its expansive garden. In 1917, Indira Gandhi, Nehru's daughter and Prime Minister of India from 1966–1971 and 1980–1984, was born in the house. In 1930, Motilal Nehru renamed the house Swaraj Bhavan (Independence House) and donated the property to the Indian National Congress, which used it as a hospital and headquarters for the All-Indian Congress Committee. The family moved into a smaller but still ornate two-story house nearby, also named Anand Bhavan, which was donated to the government in 1970 by Indira Gandhi. As centers of political activity, Anand Bhavan and Swaraj Bhavan were often searched by the British, and the latter was occupied in 1942 by the British government. Today, both houses are part of a museum complex with exhibits detailing events related to India's independence and to the prominent members of the Nehru family, as well the room in which Mahatma Gandhi frequently stayed. India is the world's largest democracy, with a diverse population—at least 22 different language groups are represented—of over one billion people. Federalism is integral to India's government, and the capital in New Delhi shares power with 28 states and 7 territories. The country's system of parliamentary democracy includes a parliament with two houses, Lok Sabha (House of the People) and Rajya Sabha (Council of States). Members of the Lok Sabha are directly elected by the people, while those in the Rajya Sabha are elected mostly by state and territorial legislatures. The majority party in the lower house elects a prime minister while the president is elected by members of both houses. Although the Indian National Congress has been the dominant political party, in power since India's independence in 1947, approximately 200 political parties exist in the country. India's constitution, developed between 1947 and 1950, incorporates ideas from Western democracies, including universal suffrage, freedom of the press, and freedom of speech. The constitution also guarantees citizens freedom from caste discrimination, although caste continues to strongly influence an individual's social status. Nehru conceived of India as a secular democracy in which the state does not participate in or promote religious activities. To support that principle, Nehru chose a lion from the age of Ashoka as the national symbol, evoking the religious tolerance that proliferated under that emperor's rule. Founded in 1885, the Indian National Congress political party was central to India's independence movement and has been the dominant ruling party since 1947. 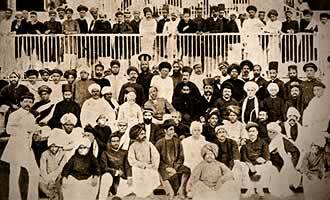 Over 70 self-appointed delegates from across India participated in the Congress's first meeting in December 1885. By 1887, the Congress included 600 members, a number that grew to 2,000 in 1889; delegates were Hindu, Muslim, Parsi, and Jain and belonged to the middle or upper classes. In its first decades, the Congress agitated for increased Indian representation in the civil service and government, jobs held at the time mostly by British citizens. Under Mahatma Gandhi in the 1920s and 1930s, the Congress Party made purna swaraj (complete independence) and a representative form of government its primary objectives. To that end, the Congress supported satyagraha, civil disobedience campaigns, against British taxes. After Britain unilaterally declared Britain and India at war with Germany in World War II, the Congress passed a "Quit India" resolution in 1942 that demanded the British government give all political power to the Indian people in return for India's cooperation in the war effort. Instrumental in negotiations for independence, the Congress became independent India's first ruling party. By 1947, the Congress was a diverse party, including members of various castes and linguistic and religious groups. 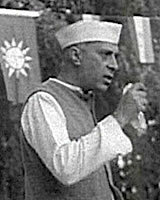 Jawaharlal Nehru, the country's first Prime Minister, led the Congress from 1946 until his death in 1964. He championed state-led economic reforms and a foreign policy of nonalignment while in office. In 1966, Nehru's daughter, Indira Gandhi, assumed the party's mantle until she was defeated in 1977, bringing to a close 30 years of Congress rule. Over the following decades, the party would be in and out of power; Indira Gandhi would again lead the party (1980-1984) as would her son, Rajiv Gandhi (1984-1989). In the election of 2004, at which nearly 400 million people voted, Congress was returned to power. The Muslim League was a political organization formed in December 1906 to defend the rights of Muslims in India during British colonial rule. The League helped establish the independent nation of Pakistan. The League's political activity gained momentum in the 1930s under the leadership of Mohammad Ali Jinnah, who became its president in 1934, and after the introduction of the Government of India Act of 1935, which allowed for the election of Indian representatives to provincial assemblies. The League won few seats in the elections of 1937; most went to the Congress, which retained the support of India's Muslims. However, the Congress's governance in the provinces came to be viewed as too preferential to Hindus and led many Muslims to switch allegiance to the League. Jinnah increasingly lost faith in the Congress's ability to represent Muslim interests, and in 1940, the League adopted a resolution calling for the establishment of an independent Muslim nation, Pakistan, comprised of the northwestern and northeastern areas of India. 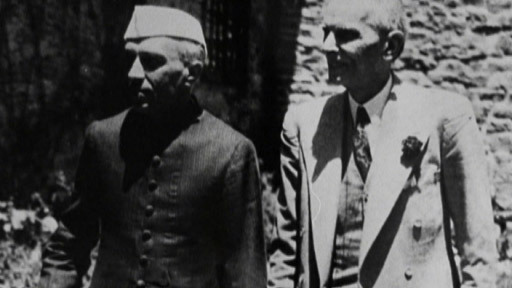 During the years that Britain fought in World War II, membership in the League increased, thanks to Jinnah's advocacy, as did Muslim support for an independent Muslim state. (At the same time, the Congress's leaders were jailed for engaging in civil disobedience campaigns.) In the 1946 provincial elections, the League won the vast majority of the Muslim vote, and subsequently reached an agreement with the British and the Congress to partition the subcontinent into the separate nations of India and Pakistan upon independence. On August 14, 1947, Pakistan was established and Jinnah became its first governor general, with Liaquat Ali Khan as the nation's first prime minister. Mohammad Ali Jinnah was Pakistan's first governor-general following the partition of Britain's South Asian colony into India and Pakistan in 1947. In 1896, Jinnah joined the Indian National Congress but by 1913 he had left the Congress and joined India's Muslim League, the leading organization for Muslims. 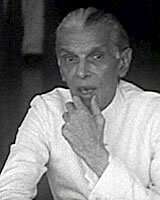 Jinnah became popular for winning both Indian National Congress and League support for the Lucknow Pact, a proposal that called for Britain to give India dominion status at the end of World War I.
Disillusioned with politics, disunity in the Muslim League, and the Congress under Mahatma Gandhi, Jinnah left political life in 1931. He returned to the League in 1934 and became its head in 1937. 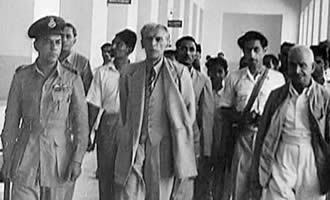 A charismatic and eloquent politician, Jinnah was elected the League's permanent president and given the title Qaid-e-Azam, or "great leader," by his followers. In subsequent years, Jinnah would increasingly lose faith in the Congress's ability to represent Muslim interests and distanced himself from the idea of a united Hindu-Muslim independent state of India. In 1940, the League adopted a Muslim homeland resolution calling for the establishment of Pakistan (an acronym for the proposed territories in the provinces of Punjab, Afghania, Kashmir, Sind, and Baluchistan). In 1946, the British, the League, and Congress came to an agreement that divided the territory united under British rule into India and Pakistan. The partition led to a mass migration of Muslims to Pakistan and Hindus and Sikhs to India, which was accompanied by unprecedented communal violence that led to the deaths of between 500,000 and 1 million people. It was also the source of the territorial disputes that characterized the relationship between the two countries for decades. Jinnah was a proponent of parliamentary democracy and was against the idea of Pakistan as a theocracy. Considered the father of the nation, Jinnah led the independent nation of Pakistan for just over a year before dying in 1948. Mohandas Karamchand Gandhi (1869-1948), known as Mahatma ("Great Soul"), was the great political leader and social reformer who founded India's nonviolent movement against British colonial rule. Born the son of a state minister in Gujarat in 1869, Gandhi moved to South Africa after studying law in London. While practicing law in South Africa, between 1893 and 1914, he became a social reformer and mobilized diverse South African communities to protest British laws, such as the poll tax, that discriminated against Indians. While in Africa, he developed the practice of satyagraha, or nonviolent protest, based on the ethical ideal of ahimsa ("no-harm" or non-violence) a precept deeply rooted in the three faiths that originated in India—Hinduism, Buddhism, and Jainism. In 1909, he wrote his landmark work, Hind Swaraj, or Freedom of India, that discussed nonviolent non-cooperation as a means to end British colonial rule. After returning to India in 1915, Gandhi organized satyagrahas against poverty and unfair taxes, championing boycotts and peaceful strikes. In the 1920s, Gandhi reorganized the Indian National Congress and wrote its constitution that prioritized Congressional representation for rural India and created a permanent committee to agitate for independence. He also adopted a simpler way of life, eschewing European clothes for the traditional Indian dhoti and shawl, which he spun on a charkha; adhering to a strictly vegetarian diet; and undertaking fasts that he also employed in social protest. From 1920 to 1948, Gandhi organized a series of campaigns that successfully mobilized Indians across the country against British rule. A non-cooperation movement in the early 1920s that urged citizens to boycott civic services and withhold tax revenues led to thousands of arrests and a government ban on public meetings. 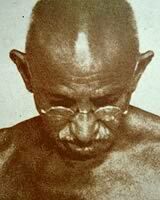 In 1930, he led a satyagraha against the British salt tax, marching 240 miles from his Sabarmati ashram to Dandi beach, in Gujarat. After picking up a lump of sea salt on the beach, Gandhi was arrested for breaking the law and 60,000 to 90,000 others would be arrested over the next few months. Before Gandhi could organize a "Quit India" campaign against British rule in 1942, he was arrested and detained in jail for the duration of World War II. On January 30, 1948, Gandhi was assassinated in Delhi by a radical Hindu nationalist, Naturam Godse. India's first Prime Minister Jawaharlal Nehru famously said after Gandhi's assassination: "The light has gone out of our lives." His methods of nonviolence would influence civil rights movements around the world and figures including Martin Luther King, Jr. and Nelson Mandela. In wanting to create a secular constitution, what deep challenges did Jawaharlal Nehru and the Indian National Congress face? While the early Indian National Congress included members from various ethnic and religion groups, why was the organization not representative of India’s population at independence in 1947? How did Indian National Congress leaders use World War II to help India gain her independence? Why did Mohammad Ali Jinnah fight for an independent Pakistan? Based upon the violent history between India and Pakistan since independence, were Jinnah's fears justified or did the partition help create the tensions?